COLOCAR EL AGUA CON EL AZUCAR EN UN RECIPIENTE TIPO PLUM-CAKE,CONECTAR 4 MINUTOS A 900 W,CUANDO EMPIECE A TOMAR COLOR RETIRARLO.ESTO ES PARA HACER EL CARAMELO ,PERO SI SE PREFIERE PUEDES AÑADIR MEDIO BOTE DE CARAMELO ROYAL AL MOLDE,YO EL MOLDE QUE HE UTILIZADO HERA UNA FLANERA DE CRISTAL,PORQUE NO TENIA DE PLUM-CAKE PARA MICROONDAS. TROCEAR LOS SOBAOS CON LAS MANOS Y COLOCARLAS EN EL MOLDE CARAMELIZADO,BATIR LOS HUEVOS Y AÑADIR LA LECHE Y EL AZUCAR,Y VERTERLO POR ENCIMA DE LOS SOBAOS. CONECTAR EL MICROONDAS 15 MINUTOS A 900W. 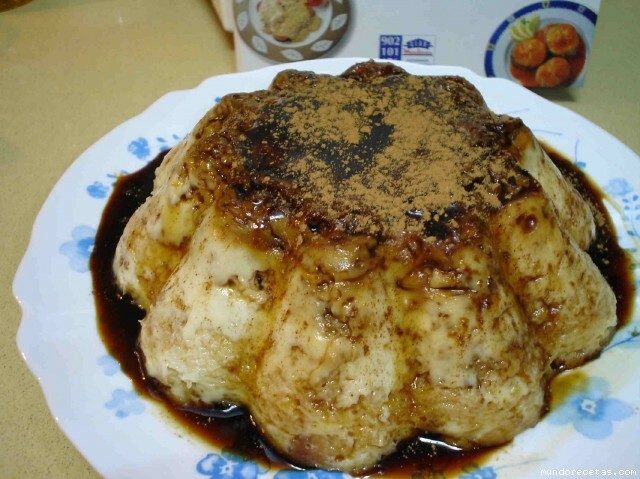 UNA VEZ TIBIO DESMOLDAR EL PUDIN Y ESPOLVOREAR CON CANELA EN POLVO. Puntuación: 3.65 sobre 5 120 votos.